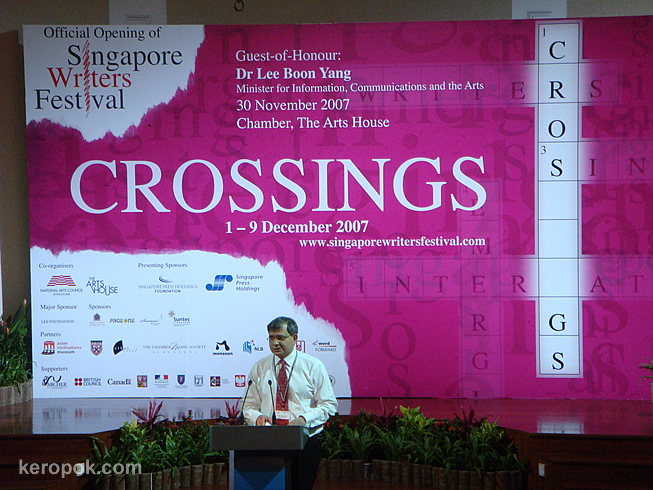 Earlier tonight I attended the Official Opening of the Singapore Writers Festival. 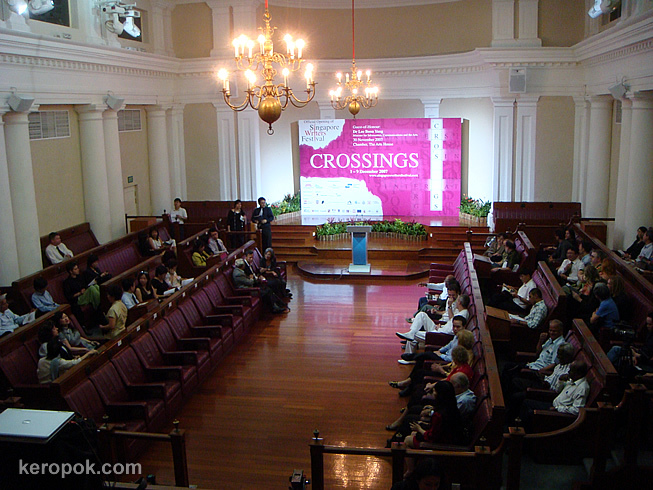 It was held at The Arts House. The Arts House was initially build as a house. It then became the Court House, then the Old Court House, then the Assembly House, then the Parliament House. Today is it an Arts Centre. If you are interested, click here to read more. This photo shows the original Parliamentary Debating Chamber. Today, the hall can be booked for private functions, just like this one tonight for the Official Opening. Oh yes, if you only got time for 1 event for this festival, you know which one to go to! 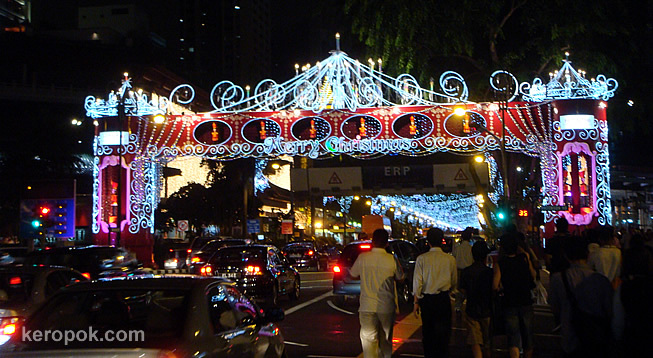 The Orchard Road Light up is an annual event that attracts both locals and tourist to the Orchard Road shopping belt. If you happen to be in Singapore right now, you should not be sitting in front your computer now, go take a look! Here are some more photos of the annual light up. I posted some the lights few days ago. This is the main arch of the light up. 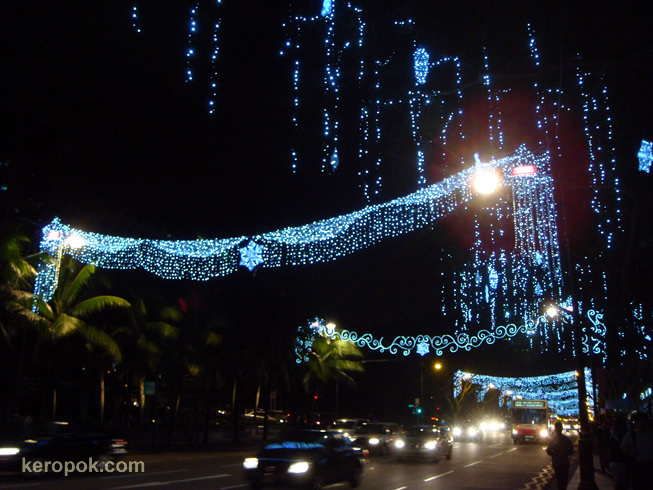 If you walk further away, you get to see the entrance arch and also the rows and more rows of lights behind. 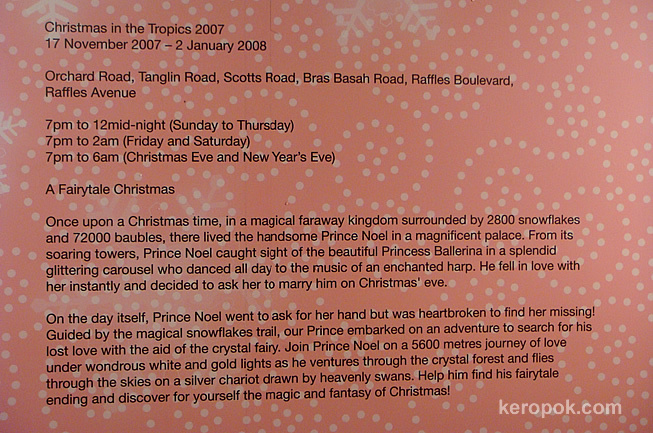 You can also visit the website that is specially created for the light up by the Singapore Tourism Board. The theme this year is Christmas in the Tropics. 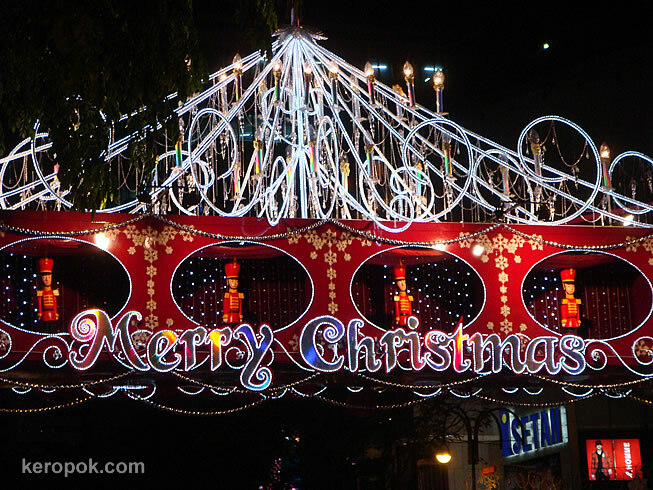 Friends from overseas, have you heard of the famous Orchard Road Christmas light up? Rubbish Made Beautiful, the Singapore way. 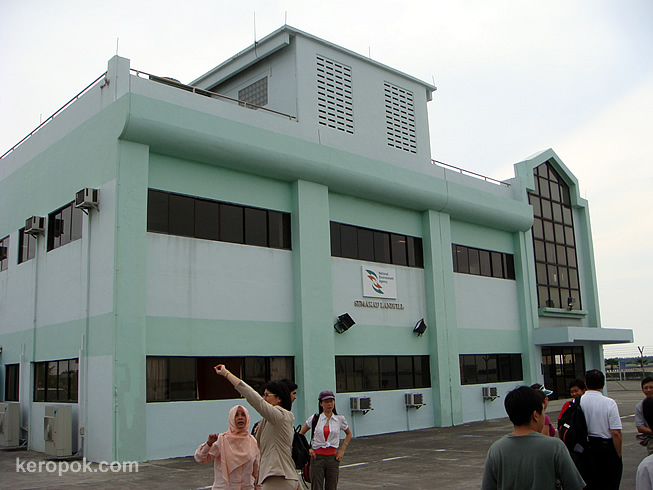 Ash from mainland Singapore is shipped here into this building on Semakau Landfill. They are then loaded into trucks that will then fill up the cells you saw yesterday. All these yukky stuff are our rubbish! But the rubbish island can be made into a recreation area! Our tour guide, who is the NEA staff giving us educational tours. Some of the people who joined in the education tour. You would not believe that this is a landfill right? 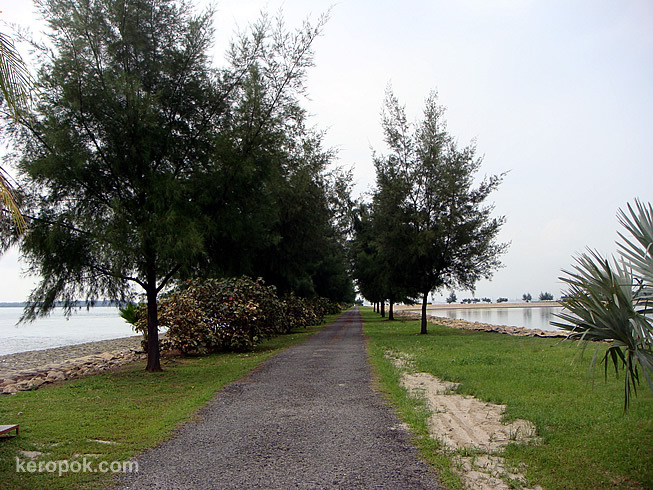 This is what the NEA staff told us, is the golden chain of Semakau. It's used to prevent boats going into this area. What was interesting here is that it was low tide, and the water from this man made lagoon is draining out. At the same time, waves are coming in. But current from the water draining is stronger. 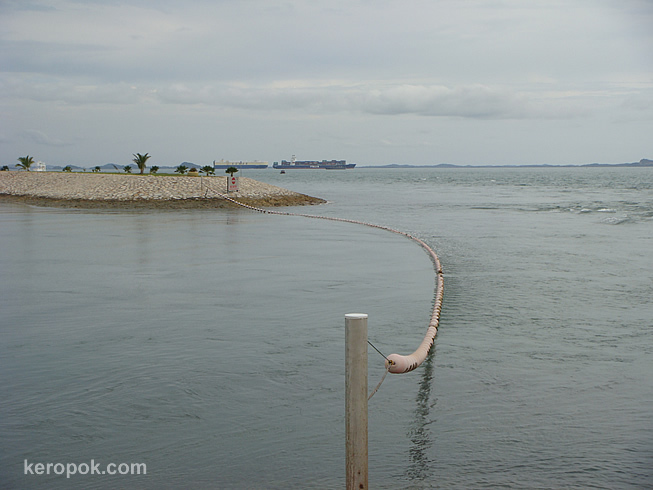 Singapore's island that's made of rubbish. Yesterday, I had the opportunity to go visit a landfill as part of the activities for Clean and Green Singapore. Rubbish and various waste in Singapore are collected by the authorised contractors and incinerated in the various incinerator plants around Singapore. The residue of that process is ash. The ash is then transported to Semakau Landfill to be dumped. 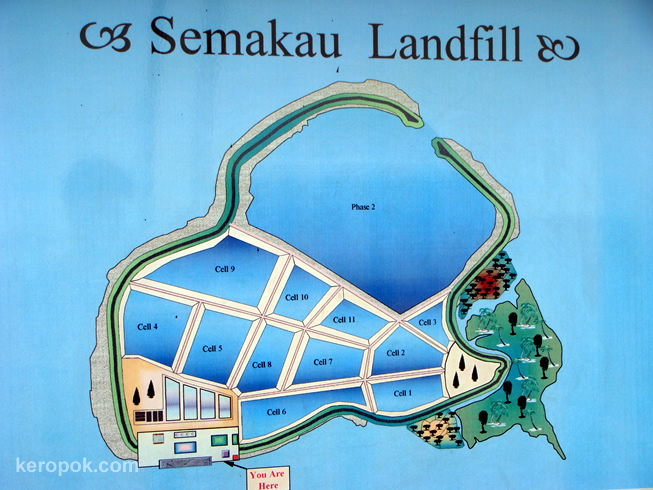 The Semakau Landfill is Singapore's only landfill for waste disposal. 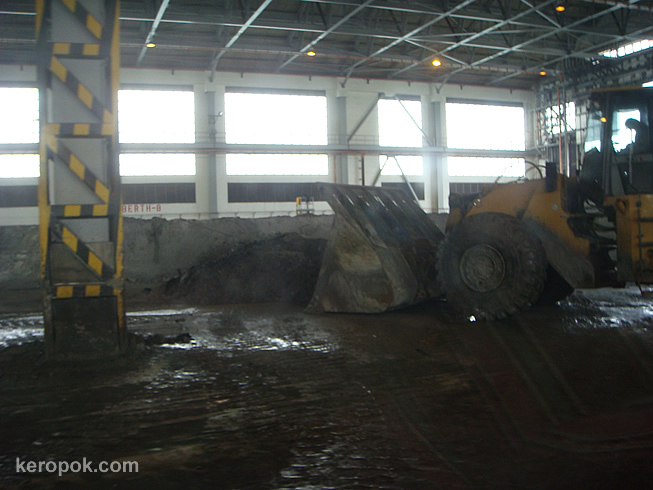 It covers a total area of 350 hectares and has a landfill capacity of 63 million m cube. 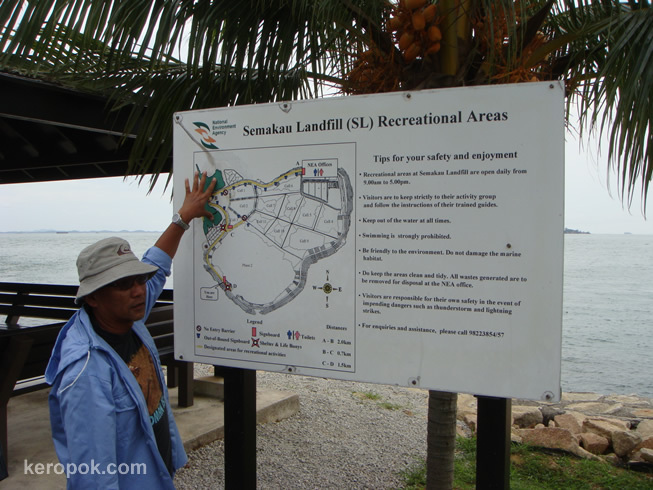 To create the landfill space, a 7-km perimeter bund was built to enclose a part of the sea off Pulau Semakau and Pulau Sakeng. It was commissioned in April 1999. The project is divided into Phase 1 and 2. Phase 1 is then divided into different cells. The cells will be utilized one by one by draining off the water. 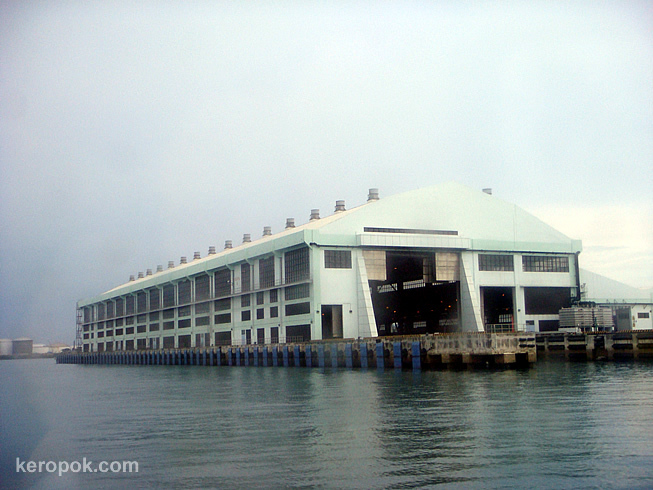 The building you see below is where we arrive after taking a 15 min ferry ride from the Pasir Panjang Ferry Terminal. You can see the "You are here" on the photo above. It's the main administrative building on this partially natural and partially man made island. We were at the conference room in this building listening to how the whole project is about and what we can do to reduce waste. We were brought around in a mini bus and a mini van. This is what we saw from inside the vehicle. The grass and shrubs you see are actually one of the cells that have been filled up and grass and plants planted on it. Below them are our rubbish! Rubbish are incinerated first so that it is only 10% of its original volume. Thus making it easier to transport and also making this landfill last longer. It is suppose to last for 45 years. 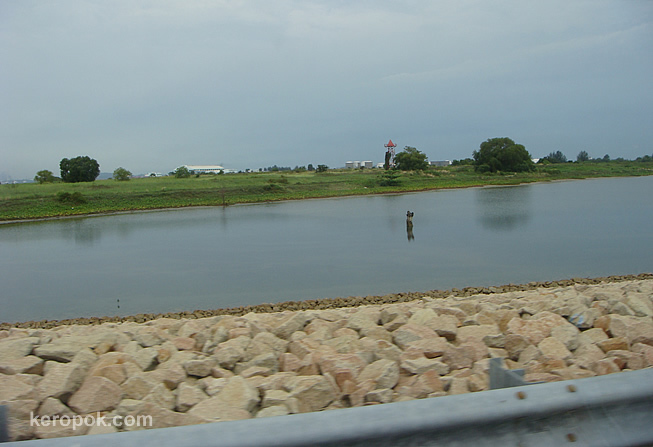 Part of the 7km bund that surrounds the man made landfill. The NEA Staff was joking to us, the Singapore Grand Prix can be held here! There's a 7 km bund with a very scenic view too! How much rubbish do you throw away? Do you buy things that come in less packaging? Do you reuse and recycle rather than throw things away? Sesame Street Characters, which is your favourite? 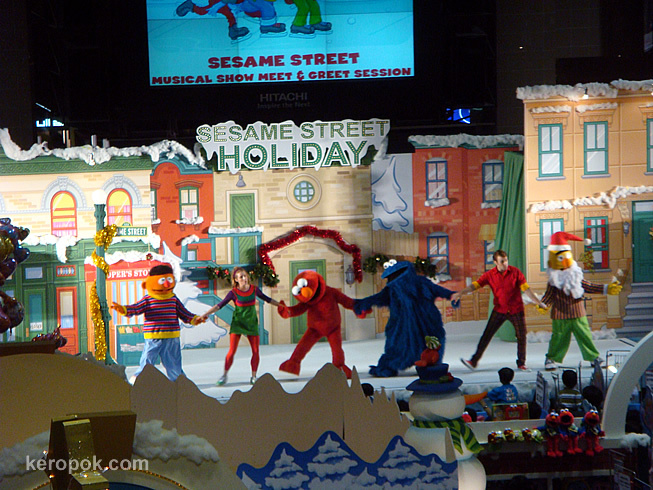 Seen here, the Sesame Street characters on stage. They were singing, dancing and jumping around, with the children's eyes all glued to them. Have you ever stopped to watch them? It is actually quite interesting! 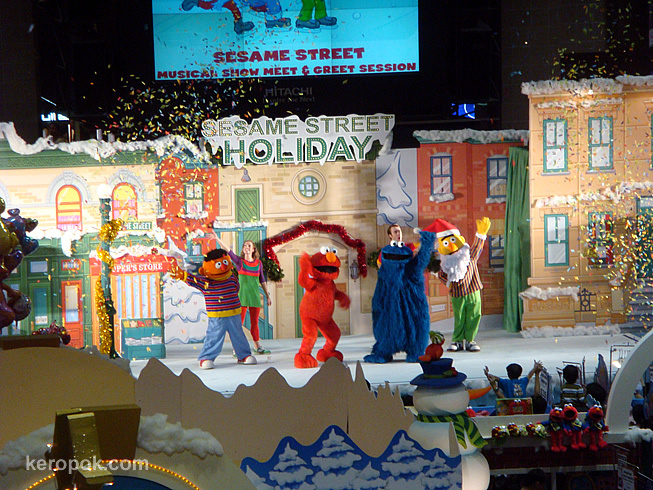 What is your favourite Sesame Street character? Was walking around shopping today. 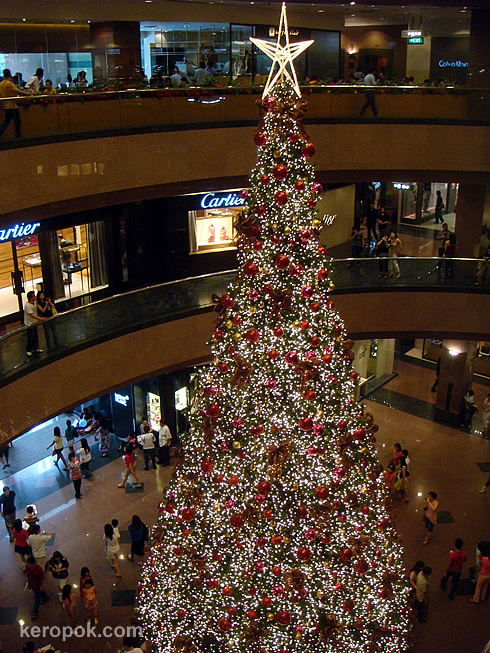 I saw that this "few stories high" Christmas tree inside the Takashimaya Shopping Centre is now glowing with all the lights. I happen to take the same tree while it was constructed too! This photo taken on 4 Nov. 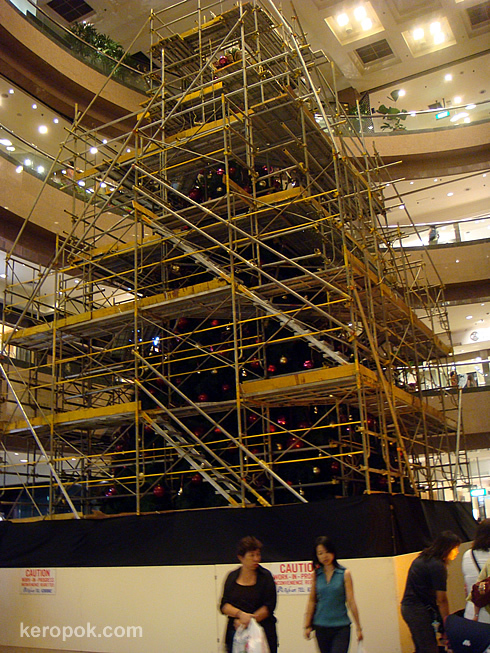 I am sure you do not have scaffolding at home while decorating your tree right? Started on Christmas shopping yet? 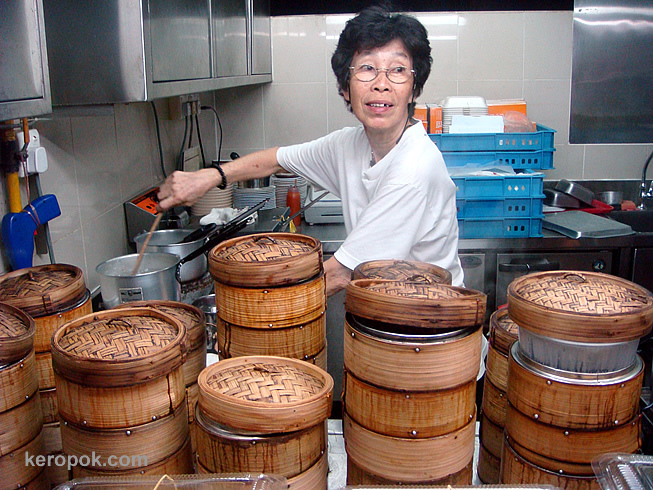 This lady boss is preparing porridge for my friend. Hmm eating porridge at 10 PM after the movie Stardust. 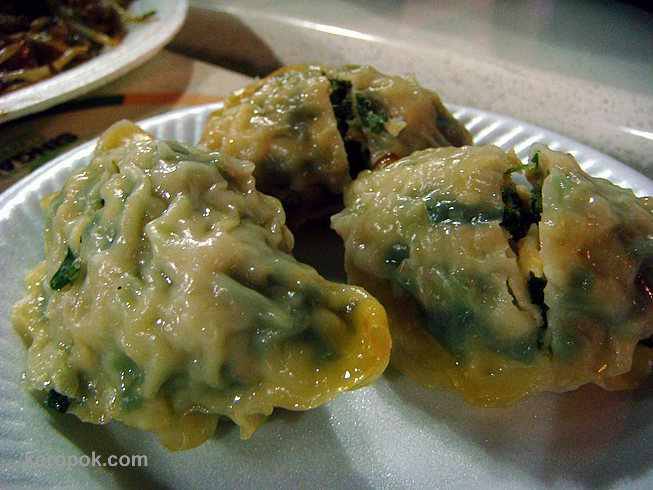 Out from the bamboo steamers, we had "Kuchai" (chives) dumplings. Do you eat the whole day long? Are you one who have supper every night? 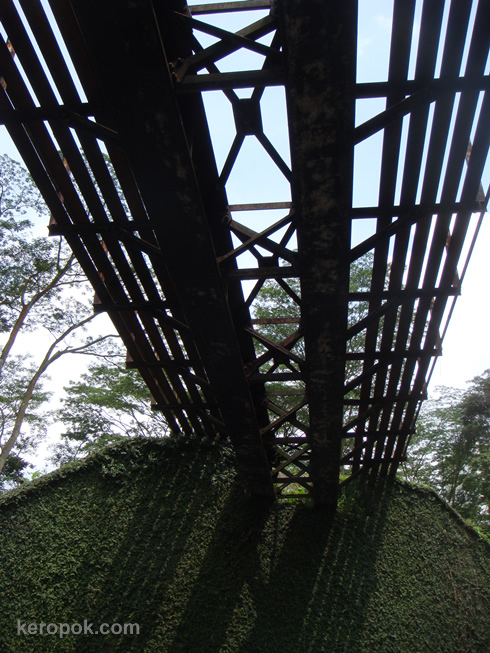 Remnants of an old unused railway bridge over Sunset Way in the west of Singapore. These are the old unused Keretapi Tanah Melayu (KTM) tracks I believe. If you want to read more about KTM trains there's this fan club. Singapore viewers, have you heard of the Singapore Kranji Railway? Read this article by Lam Chun See. It sure is interesting! I remember posting a post on Defibrillator in September. Well today, I attended a session on how to use the AED or Automated External Defibrillator. Before that, I have no idea what it does! Well, it's the thing that on TV, they have "STAND CLEAR" then they send this electric shock to the patient and tries it again and again until the person's heartbeat resumes. Haha.. This is a portable one. It's meant for anyone who knows how to use it to save someone who is having cardiac arrest. Survival rate of the victim decreases by 10% every minute. We were told we had around 50 over units of this all over the campus, and it could possibly be the most concentrated number of AEDs in Singapore and maybe the world! This model is totally automated. If the place where you work has a AED, go for a briefing on how to use it. It might come in handy one day. It's especially useful if you are a certified first-aider with still a valid cert. Anyway, if someone is suffering from cardiac arrest and you happen to see one around, this is what you can do. - Check if the person is OK.
- Get someone to retrieve the AED. 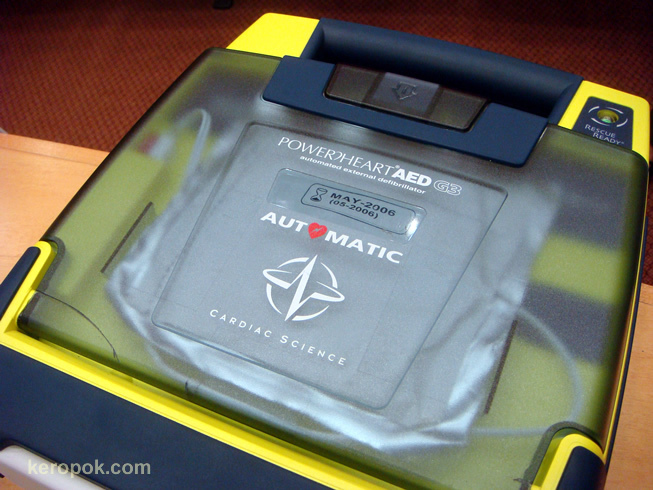 - Open the AED cover, then follow the voice prompt to use it to regulate the victim's heartbeat. - The machine is automated and will monitor and analyze the heart rate, ECG, whatever else. - When it deems necessary to 'shock' the victim it will say "STAND CLEAR", and automatically administer the shock. - It will then prompt to apply CPR - give the breathe of life and apply compression. - Repeat until an ambulance arrive. The machine is quite intelligent, we were told, we just need to follow the voice instructions. I guess most people would not even want to try right? But if the person is your relative or love ones, you might. So the above might be useful. So get yourself trained! If you are in Singapore, you can get FREE First Aid and CPR Training provided by the Singapore Civil Defence Force (SCDF). There's a Community Emergency Preparedness Programme that you can join. View their website for details and registration. Realise I mention FREE? Haha.. that's the only thing that will attract people in Singapore right? Ooops, must be my longest post to date. I am not medical personnel. So that's what I know, so get yourself trained to be sure. RK Pachometry. 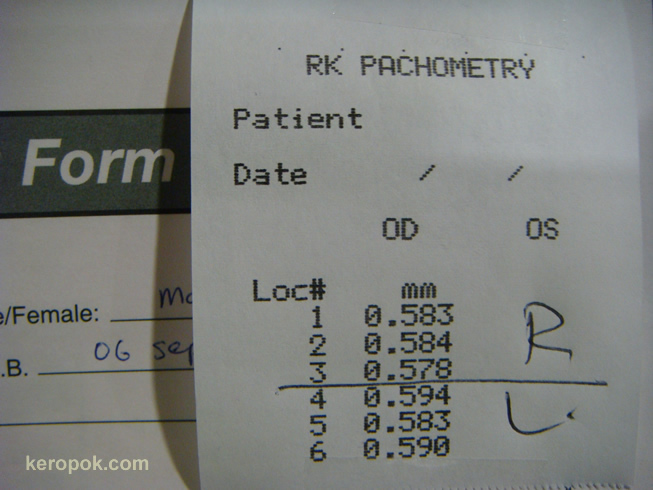 Cornea thickness test for Lasik. Few weeks ago, we were glad that there was this free eye test thingy organized by the Wellness Centre for all staff in our company. Since it was free, most of us signed up. We were not sure what to expect, so we just followed the herd. We were put in lines and proceed from station to station. Some people were selected to go through this special test where we had eye drops dropped into our eyes to numb it. Then they had this machine with a probe that looks like a pen. Arrghh. They were going to poke my eye with it. It was to measure the thickness of my cornea. This is the results of the test. The last station was the consultation with an eye doctor. The eye doctor had this light emitting machine that is able to look into the back of our eyes. It was an interesting experience. OK, with the correct cornea thickness, I was a perfect candidate to go for lasik. Haha.. OK, that's the expensive part of the free test. haha..
Will you go for Lasik? Or if you have gone for Lasik, would you recommend others to go? By the way, Singapore seems to be the myopic capital of the world! The only place in the world with the highest concentration of short sighted people. Colleague and I, we were going for lunch when we saw this banner. 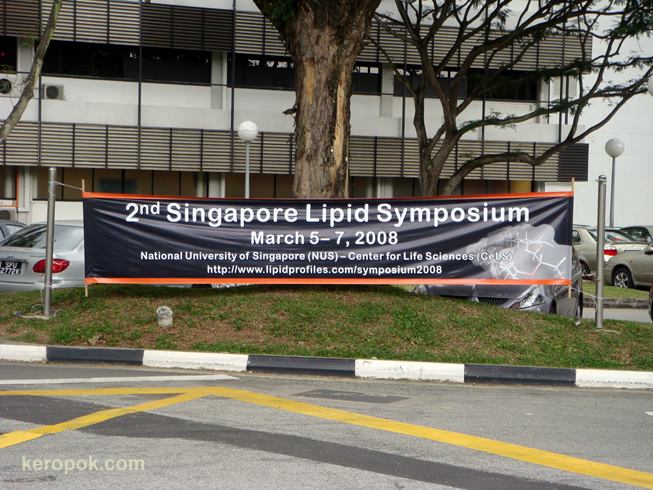 Lipid Symposium. Ain't lipid fats? Wow, people who are interested in fats will come together. How interesting! If you go to their website, you would know they are not what we think it is. haha..
NUS: Say Yes! - Making a difference to our students. 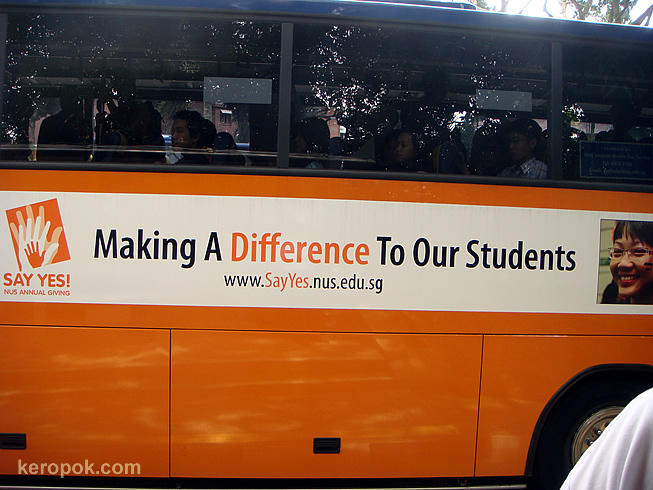 This is spotted on the NUS Internal Shuttle Service. Say Yes! to NUS Annual Giving. Making a difference to our students. NUS Students, Staff and Alumni, have you considered giving? I will be. I am sure many students will benefit from it. Visitors from DailyPhotoBloggers, do universities in your city have fund raising activities? Do you contribute to it? 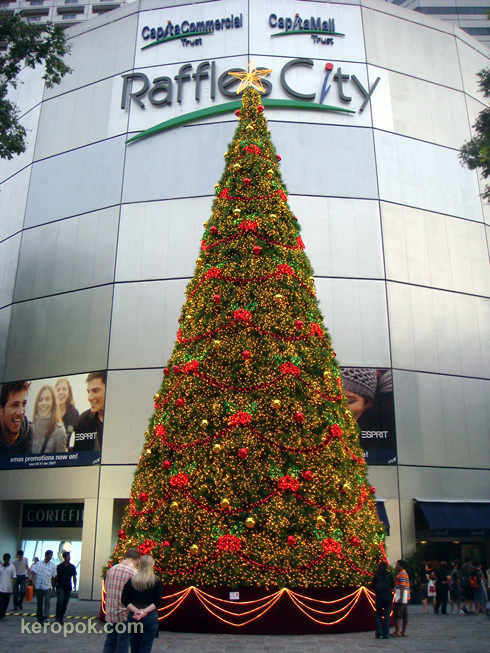 It looks like most Christmas deco is up all around the city. I think only the people who have not done it are the ones who wants to put up deco in their homes. This was taken yesterday when I was walking to meet friends for dinner. It's really a tall tree eh? Do you put up Christmas deco in your home? It's still early, but the lights are up! Not officially 'launched' yet, but some parts of the lights are already brightly litted and everyone seems to be taking photos of it. Mushrooms grow when the season's rainy. These few weeks, it has been raining on and off. When it does rain, mushrooms sprout here and there. This was taken by the roadside on the grass patch. 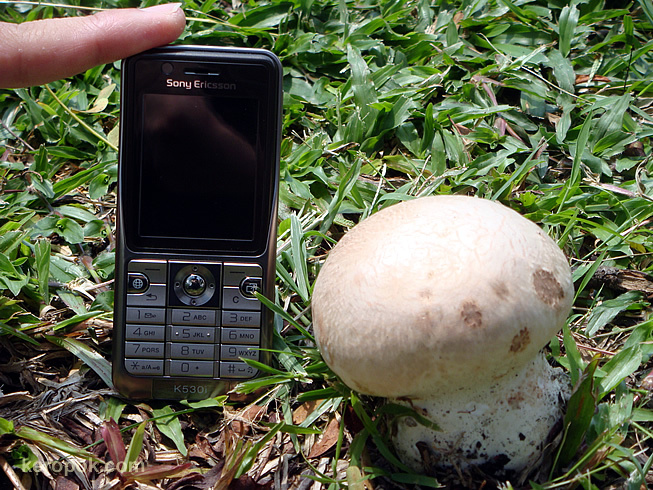 That's my colleague's mobile, it is used to show the size of this mushroom we saw! Are you able to recognize edible and non edible mushrooms? I can't. No, we did not plug this mushroom out, we don't know if it's edible! This is another of the signs series. A very stern warning as well. 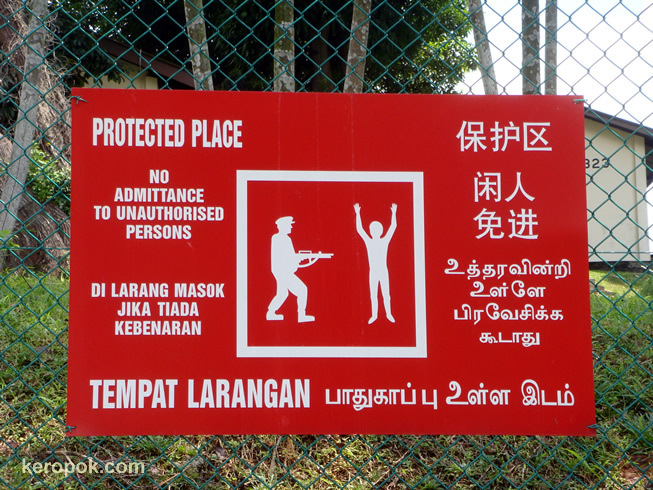 It's one of those signs, that even if you can't read any of the 4 languages there, with the colour and the graphic, you would stay away. In your country, do you have similar signs? Just a quick photo today. A few days ago, remember when I took the merlion at night, I also took this. 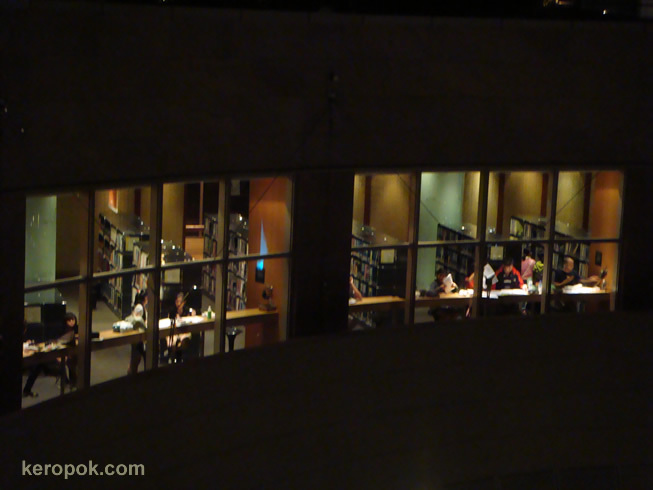 Hardworking people at the Esplanade Library doing research in the night. It's one of the Singapore National Library branches that is dedicated to the Arts. It has lots of books, music scores, DVDs, CDs all related to the Arts. Yes, you can borrow all of them. The other library I know that has music scores etc is the Yong Siew Toh Conservatory Library at NUS. What's your favourite genre of books that you borrow from your library? 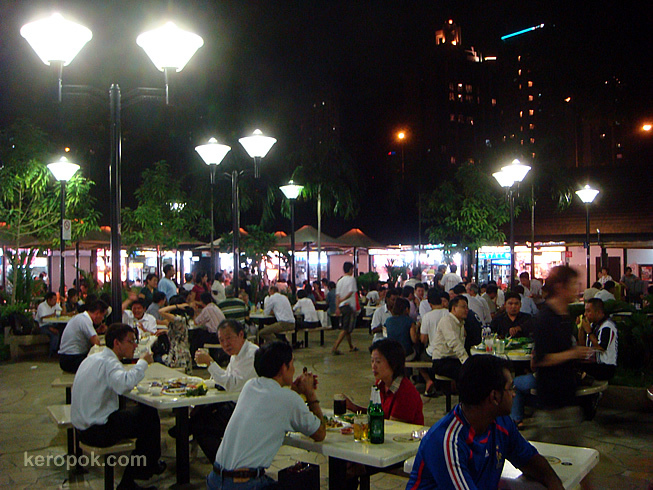 This might be one of the most famous food centre in Singapore. It is more popular with tourist than with locals. 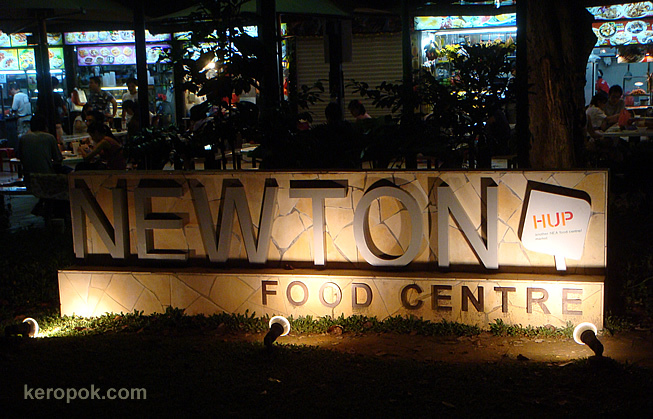 If you have visited Singapore, you most probably have drop by this place. This is the main entrance of the food centre. The many people who are eating here. If you wanna see what we ate here, click here. Have a great mid week! Terminal 3 Open House to public starts today! These are part of the many photos I took two Saturdays ago at the Terminal 3 preview that was opened to certain groups of people first. Remember to visit the toilet too! haha.. 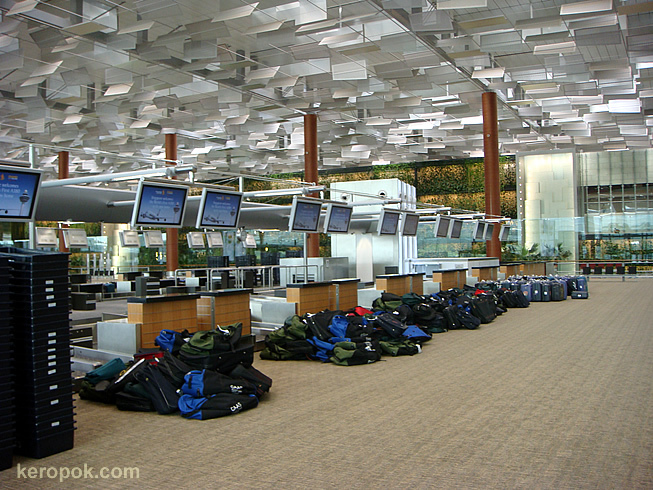 In Jan 2008 when Terminal 3 opens, wow! 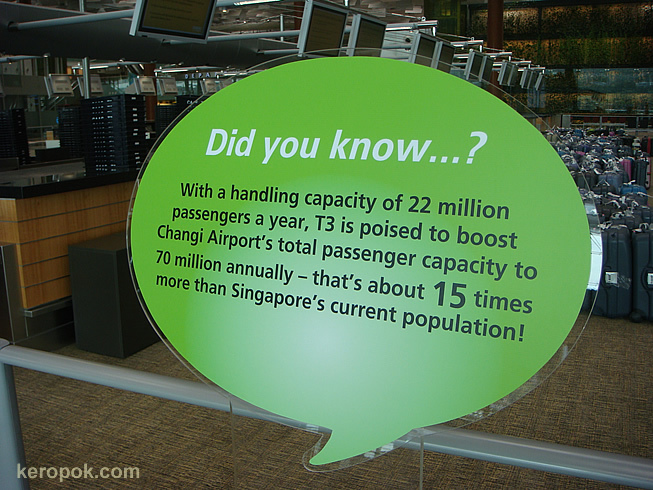 the airport can cater to 70 million users annually, more than 15 times the Singapore population! Visitors from overseas, you should visit Singapore after 8 Jan 2008 if you want to use this terminal. Fly these airlines which will use Terminal 3. 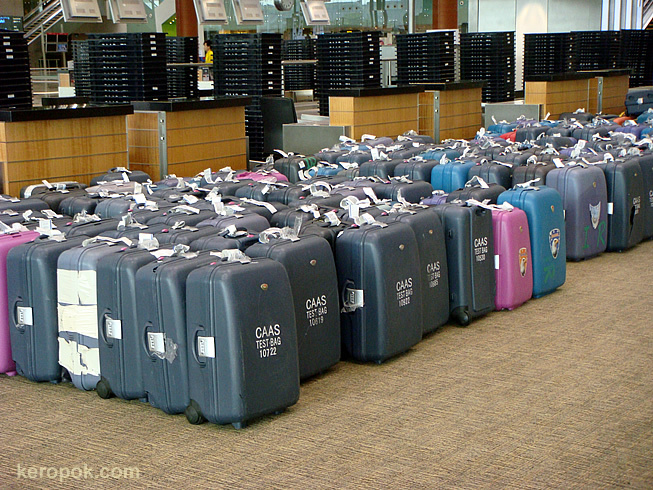 Singapore Air, China Eastern Airlines, Jet Airways, Qatar Airways and United Airlines. This afternoon at the National Library open area, there was a Youthépreneur National Pushcart Challenge. Was there because sis wanted to show some support to her students who were participating in the event. 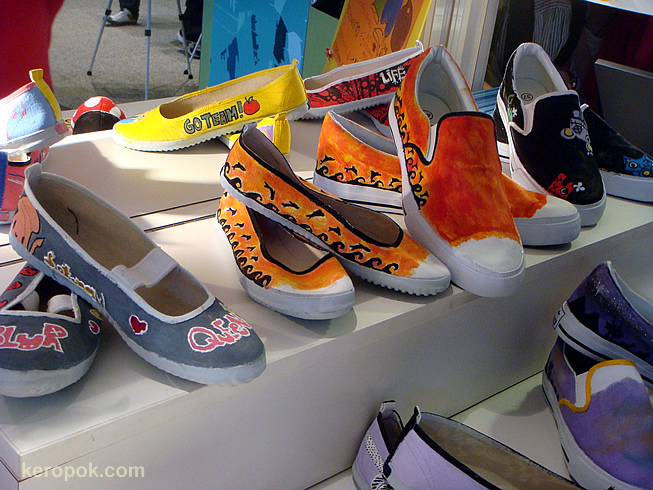 Here's the beautifully designed shoes that was part of the things they were selling. Well, sis bought a pair of shoe and some biscuits that the students made. 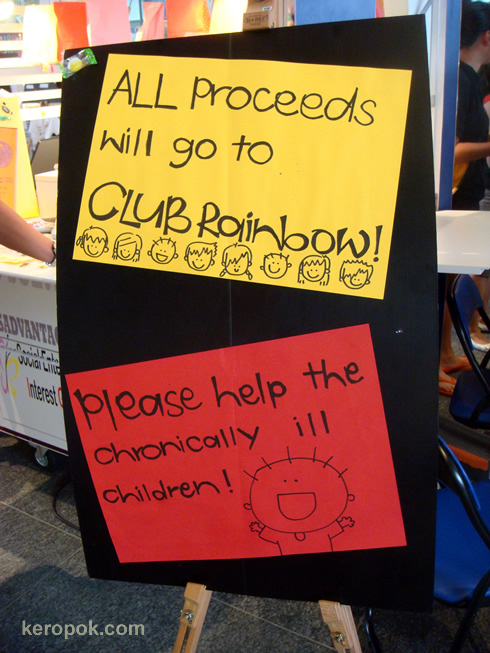 Yup, all proceeds went for a good cause. 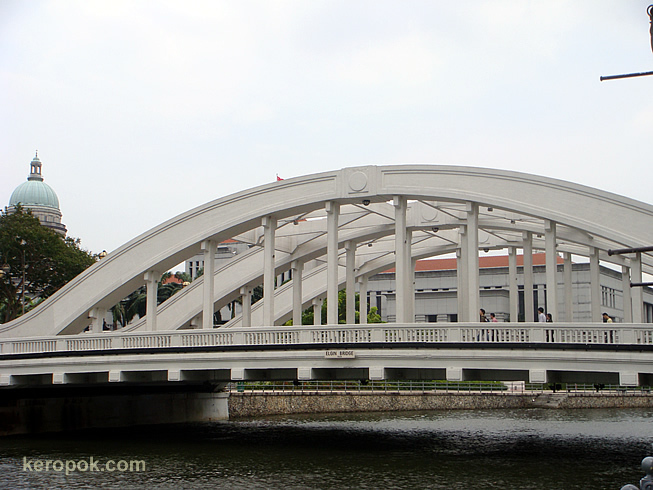 There are many bridge over the Singapore River. Let me start a series about it. This is Elgin Bridge built in 1929. In Hokkien it is known as "thih tiau-kio", and in Cantonese, "thit tiu-khiu", both mean iron suspension bridge. The existing bridge was completed in 1929, and was named after a Governor-General of India, Lord Elgin (1862–1863). As this was the first bridge to be built across the river, the two roads leading to it were named North Bridge Road and South Bridge Road accordingly. It was previously a wooden bridge. Bus number 888, must be lucky day! Today, colleagues and I took a cab out for lunch, and after lunch we thought... hmmm... maybe we should just take a bus back to office. We boarded the bus and falfway through, colleague said, wah.... this bus has a very good license plate number! Back to the 'Good number' thingy... Let's zoom in... 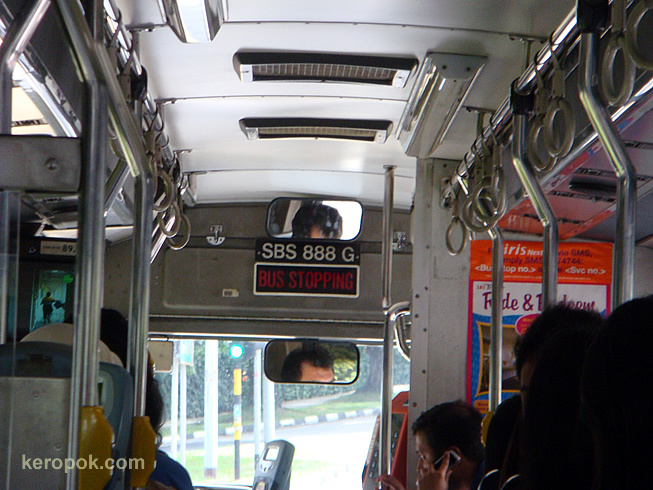 It is SBS888G, a triple 8! A number chinese would associate with prosperity! Just thought that it was interesting. Any of you out there who are into these numbers thing? Well, I am not. Today's newspaper did have a good news about buses. 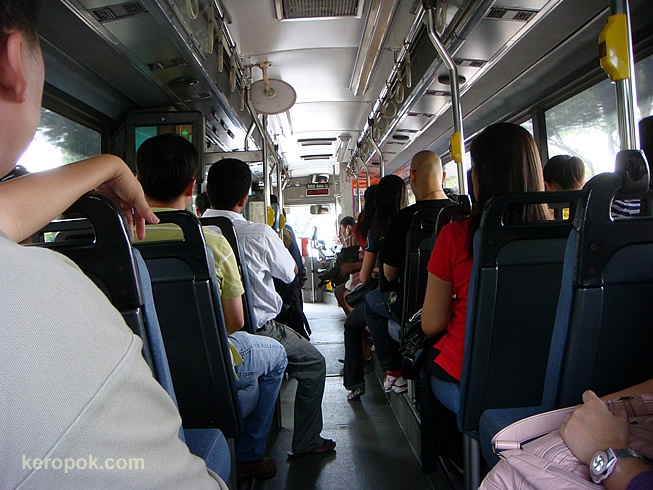 A few days ago, I posted a photo that says free Wifi on Singapore buses, well, the free Wifi officially starts today! 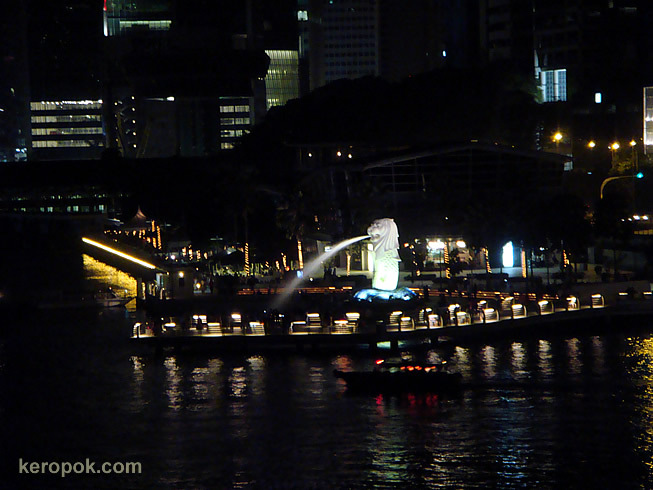 This is the famous Singapore Merlion. Few days ago, I was waiting for my sis who brought her students to watch Chitty Chitty Bang Bang. Went up to the roof top to enjoy the Singapore Night View and took a picture of this. For friends and visitors visiting who are Hindus, a very Happy Deepavali! 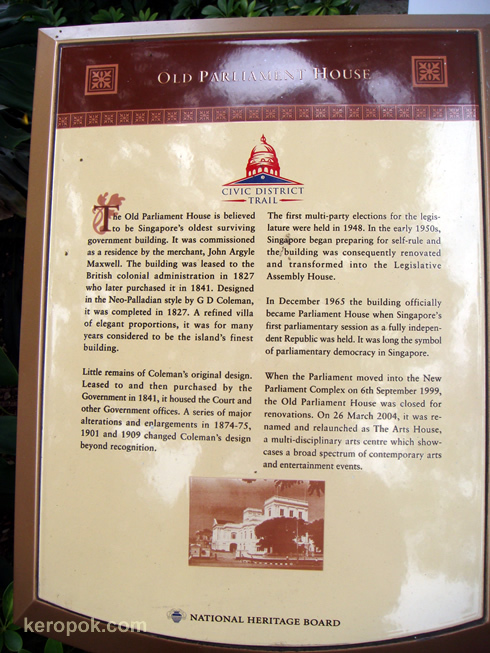 The Old Parliament House, the oldest surviving government building. 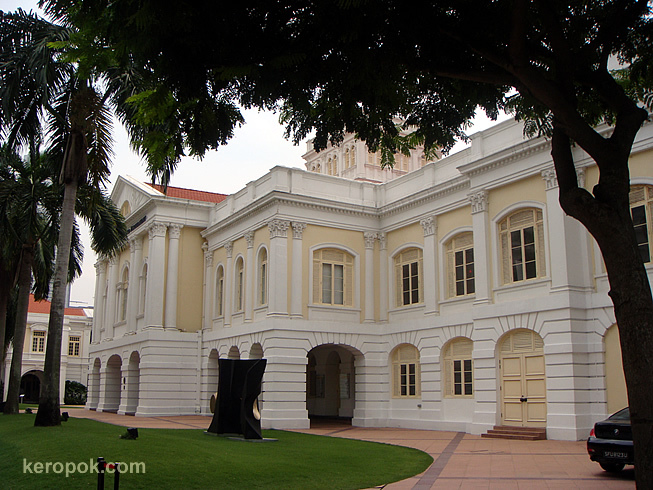 This is the Old Parliament House, believe to be the oldest surviving government building in Singapore. I was there to take collect a test phone by my mobile provider a few weeks back, so I took a picture of this building. If you want to know more, read the writing on this photo. It's quite an interesting read! This building now host The Arts House, which is a multidisciplinary arts centre. Formal Chinese Dining - which chopsticks to use? 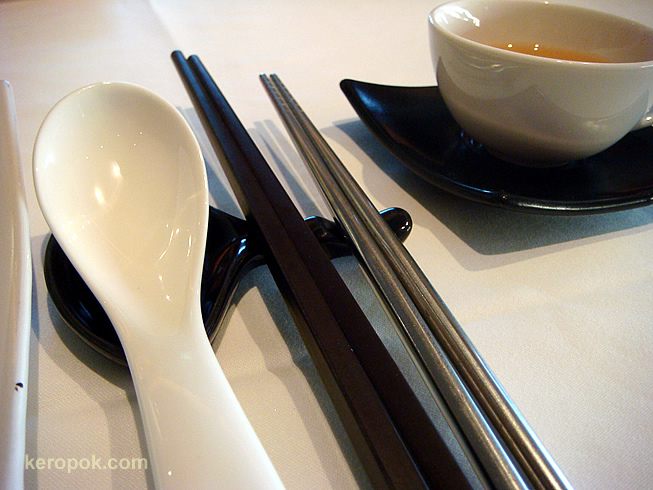 But if you are in a more formal chinese dining, which pair of chopsticks do you use? Chinese food is usually communal and not individually served. So, there needs to be two pairs of chopsticks. Which pair to use? Well, the steel pair is for your personal use, ie put food into your mouth. The black pair it to take food from the main plates to your own plate or bowl. I recently went back to this restaurant that has this not very common double chopsticks thingy. If you would like to see what I ate, click here. Today's my sis' birthday. Happy Birthday Dearest Sis! 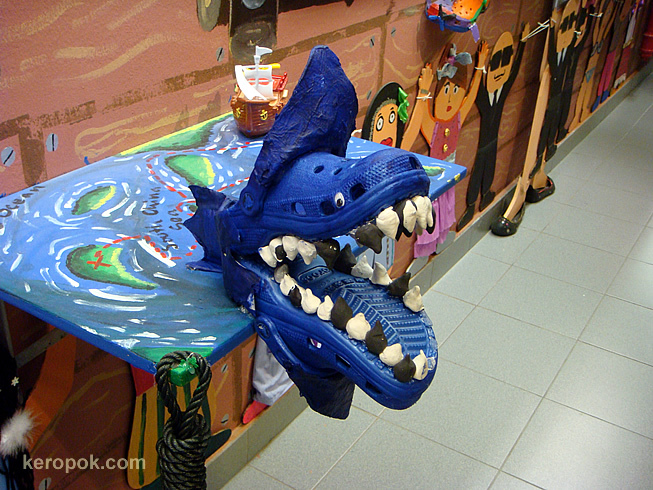 Crocs - Footwear or Artwork? Wow. 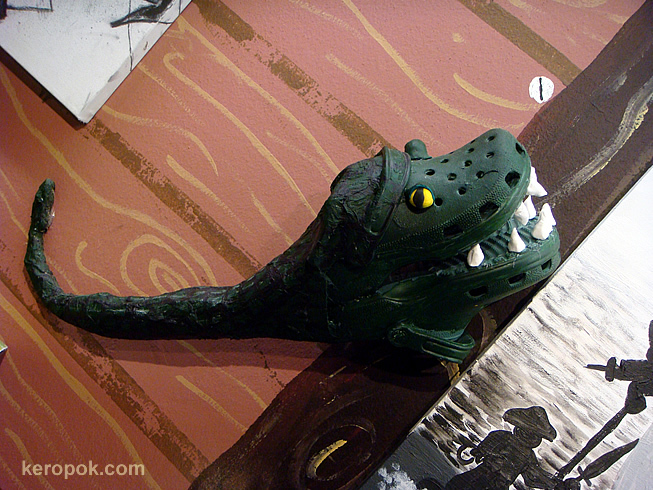 What can you do with Crocs other than wearing them? You can make artwork out of them! The artwork is on display at the underground walkway between CityLink Mall and The Esplanade. 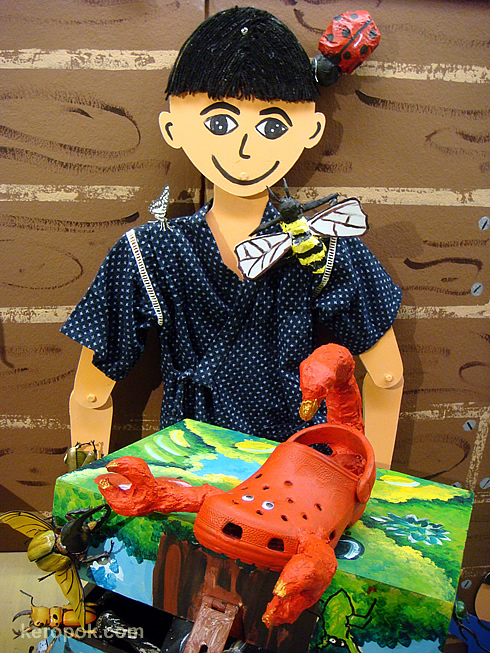 It is called Artventure and its by the Young Talents from Boxed Out I, II, III, and co-curated by Studio Haroobee. Hmmm I have never heard of it until yesterday. Hmmm anyone of you wear crocs? Well, I don't. Not for the faint hearted, but if you can put your hand on the car the longest, you win it! These guys and gals have been on it for the last 29 hours and 51 mins, and they are still on it! One of the ladies group on Car 8 still going strong... The guys at Car 3 still has lots of determination too! Another group of ladies at Car 7. Also the guys at Car 1. Guys at Car 4. Looks like contestant 145 has tired legs. Hey, hang on! You can see what time this shot was taken. 6:51 PM and it has been going on for nearly 30 hours. Last year's winner held on for 73hours and 56mins!! 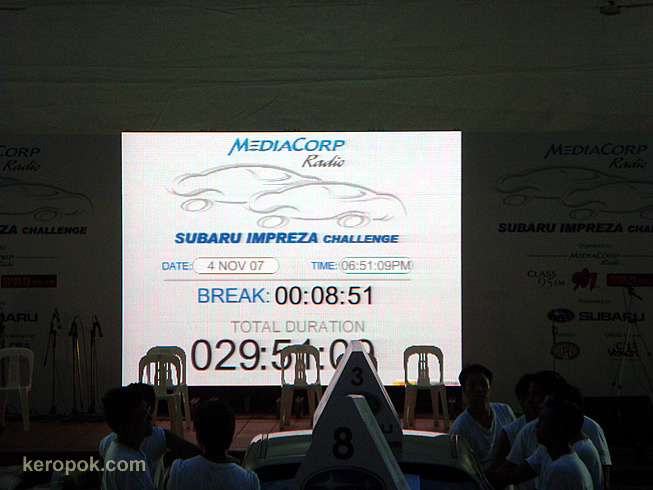 Find out more at the Mediacorp Radio Subaru Impreza Challenge 2007. Will you take part in such competitions to win a car? Free Wifi on Singapore Buses now.